What is the best Mother’s Day gift you have ever received? For my first Mother's Day, when our daughter was only a month and a half old my husband made a card from scratch with her photo on the front and included her hand and footprints on the inside. He let me have a sleep in and brought Molly into our room to play with me while he made me smoked salmon eggs benedict for breakfast which I ate in bed. Bliss. Describe your perfect Mother’s Day... A sleep in, followed by breakfast in bed with the whole family. A massage at a day spa and lots of play time and smiles with my four beautiful kids! What is your favourite breakie spot that the kids should get your coffee from? So many great breakfast spots in Canberra! Lonsdale St Roasters, Urban Pantry, ONA or even just our local cafe The Drawing Room. If you could have 1 wish this Mother’s Day what would it be? For our triplets to sleep through the night!! What is the best Mother’s Day gift you have ever received? My bubbas are still little, so the hand made presents are the ones I most treasure. Last year, 4-year-old Luella painted a flower pot which I have on my desk. Describe your perfect Mother’s Day... To be woken up with smiling faces, a cup of tea made by my two-year old Max (with his dad’s help), to go somewhere lovely for lunch and then be treated to a massage at the end of the day. Heaven. What will you be doing for your Mum this Mother’s Day? We’ll no doubt go out for lunch or afternoon tea – Luella and Max call mum BamBam and she will be spoilt rotten by them on mother’s day. They adore her, as do I. I’ll get some pictures of the kids printed and framed as a gift as that’s genuinely what makes mum happiest. What is your favourite breakie spot that the kids should get your coffee from? I’m a chai girl and my favourite place is a beautiful little café near home in Mosman, called The Mews. If you could have 1 wish this Mother’s Day what would it be? I honestly feel so fortunate. I have two happy, healthy children. My only wish is that this doesn’t ever change. Describe your perfect Mother’s Day... The perfect Mother's Day for me would have to start with Breakie in bed made by my hubby and little girl (who can't cook yet but will learn very quickly hehe) and just a simple, grounding day with my hubby and daughter in a park on a blanky with lots love and laughs visiting the grandparents in the evening to end the perfect love filled, simple day. Quality time with my loved ones is priceless to me. If you could have 1 wish this Mother’s Day what would it be? My wish already came true when I gave birth to my beautiful, healthy daughter - there is nothing more I need or want. What is the best Mother’s Day gift you have ever received? Cuddles from the boys as they both love their cuddles. Dylan is also great at choosing gifts, last year he gave me a divine candle from his schools Mother's Day stall and Matt helped the boys make a gorgeous photo album of our trip overseas. Describe your perfect Mother’s Day... Yoga in the morning followed by breakie and a massage. It doesn't get much better than that! What are you doing for your mother this year? Well I just gave my mum her Myer Mother's Day Gift Card as Prezzee has just launched a fabulous promotion with Myer. 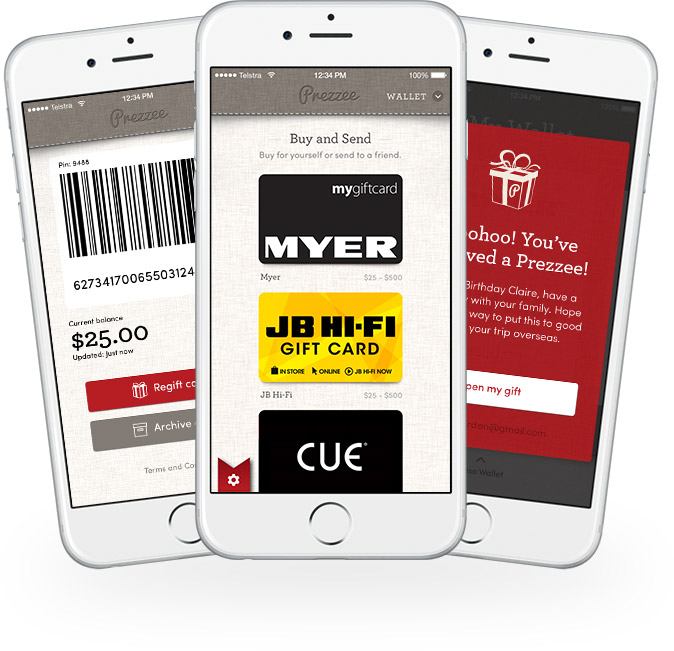 Purchase a $100 Myer Gift Card and receive a BONUS Myer Gift Card via the Prezzee App or new website. I suggested she go in-store now and buy herself the gift she likes #bestprezzee. For the actual day, so long as there is good food involved and time to watch the kids play it will be a great day. I know that's what really makes mum happy - time with her family. What is your favourite breakie spot that the kids should get your coffee from? At the moment I am loving the Nine Cafe in Bondi. They do an amazing almond milk cappuccino which I love. If you could have 1 wish this Mother’s Day what would it be? My best friend lives in Venice, Italy. For some months her mum in Sydney has been not well. I would love more than anything to fly my girlfriend out for a week to see her mum. I know how much that would mean to them both.